This easygoing and laidback style is represented in a cherry finish with extra-thick end panels and complemented by a seamlessly integrated black glass top. 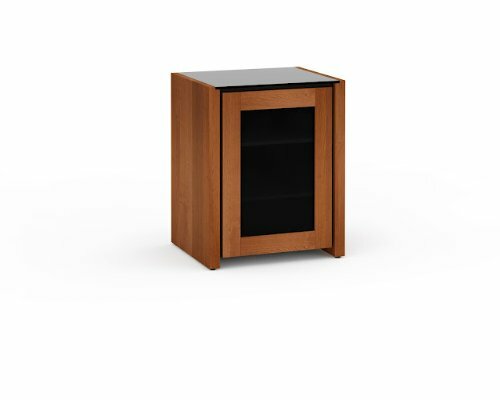 AV Cabinet - Engineered to PerformThis easygoing and laid-back style is represented in a cherry finish with extra thick end panels and complemented by a seamlessly integrated black glass top.What's in the Box:Chameleon Corsica 317 Single CabinetSpecificationsOverall dimensions (W x H x D): 25.75" x 32" x 21.25"Interior dimensions (W x H x D): 19.75" x 27.75" x 19.5"Interior includes: 2 adjustable shelvesRecommended TV size: Up to 40"Top holds: 150 lbs.Adjustable shelf holds: 75 lbs.Product weight: 100 lbs. If you have any questions about this product by Salamander, contact us by completing and submitting the form below. If you are looking for a specif part number, please include it with your message.